Dental crowns are caps that are shaped like teeth. They are placed over your tooth in order to be able restore its former shape, strength, size and of course to make sure that it looks better too. Once crowns have been cemented into place, they will be able to fully encase the portions of the teeth that are visible and lie above the line of the gums. They can protect a weak tooth. Say for example, one that has been damaged from decay. It can also hold parts of a tooth that has cracked, together. A crown will be able to ensure that a tooth that has been worn down or severely damaged can be restored. It has the ability to be able to cover and add support a tooth that has a large filling and most of the tooth is gone. They can also be used to hold dental bridges into place, to cover existing dental implants or to make cosmetic changes to unsightly teeth. When kids have baby teeth, crowns can be used to help save a tooth that is badly decayed and cannot support a filling. They can help to protect the teeth of kids that are at a very high risk for tooth decay, down to the child not being able to keep up a good standard of oral hygiene. They can also ensure that your child will not have to undergo repeated anesthesia. Permanent crowns are made from stainless steel or metal, like an alloy or gold, resin. Ceramic or porcelain that is fused to metal is also commonly used to make crowns. Stainless steel crowns are ones that have been prefabricated and used on the teeth as a temporary fix. A stainless steel crown will act as a barrier to protect teeth whilst your permanent tooth is made out of other material. In kids, they are used to place over primary teeth. 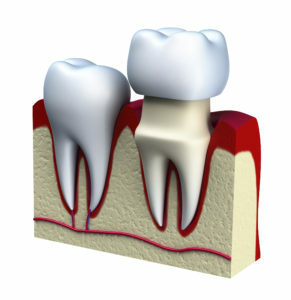 They then protect the tooth from further damage and acts as an external casing. They do not require the patient to visit the dentist multiple times, and are cost effective too. Metal crowns including gold alloy, and other types of alloy like palladium, chromium or nickel, when compared to the other types of crowns that are on offer will mean that less of the tooth structure needs to be taken out. The wear of opposing teeth is also minimal with metal crowns. They are strong and can withhold chewing and biting forces- they last longer and very rarely break and chip. The largest and most obvious down side of having a metal crown fitted is that they do not fit in with your other teeth, and of course it will be a lot more obvious that you have had dental work done. They are best chosen for molars that are at the back of the mouth and not in sight when you smile! Porcelain crowns that are fused to metal, they can also be matched to the colour of other teeth in your mouth. They do allow a lot more wear to the surrounding teeth though and the porcelain is more prone to breaking and chipping, much like natural teeth. The metal underneath the porcelain can sometimes be on view, and will present itself as a dark line, particularly at the gums. This is very common in receding gums. This type of crown is a great choice for back or front teeth. Crowns that are all resin are cheaper than other types of crowns, but you must remember that they do wear down after some time. They can also fracture more than the ones that are made from porcelain that has been fused to metal. All porcelain or all ceramic crowns are able to offer you a much closer colour match to any other types of crown. They are also a good go to option for those that have a metal allergy. They are not as strong as the ones that have metal attached, and they will affect your surrounding teeth more too. They are a great option for front teeth. Permanents and temporary crowns, the temporary crowns can be created in your dental office, and permanent ones will have to be manufactured in a dental lab. Temporary versions are made from stainless steel and acrylic. They are able to be used in temporary restorations until the permanent option is made. A milled or zirconia crown- they have to be digitally constructed in an office or lab. Because of the clever technology behind this type of crown, you will not need to have an impression of the teeth made beforehand. So, there you go, a little more insight to getting a crown. Why not contact VitaSmile today?